Our visit to Elio Sandri was of the most special visits on our most recent trip to Piedmont. This very small producer is a winemaker to watch. 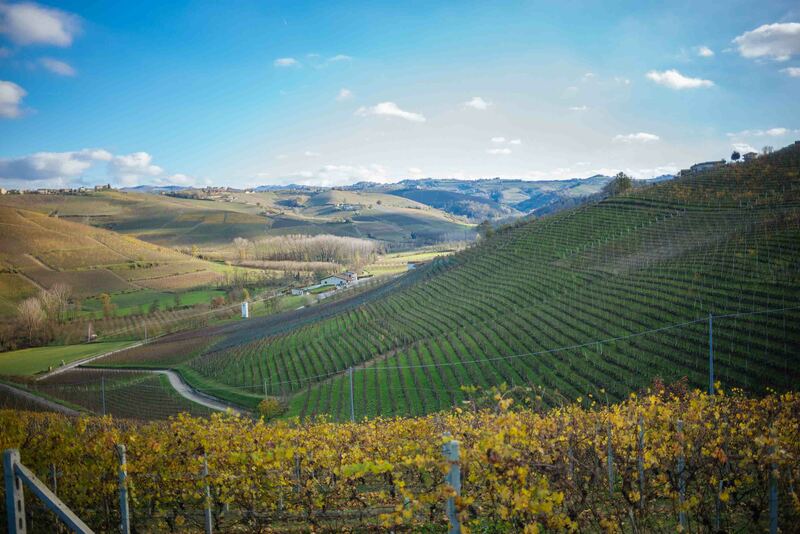 Elio’s family has been producing Barolo since his father purchased the estate, but only recently have the wines started to attract critical attention. 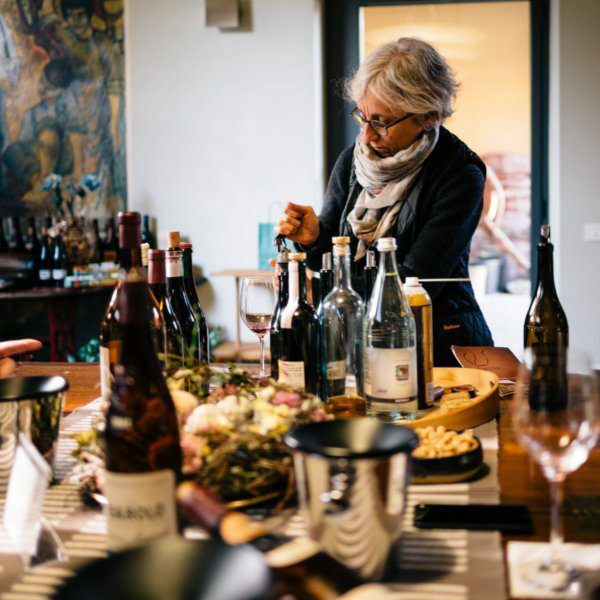 Located just on the other side of the hill from another one of our favorite producers, Cascina Fontana, Elio Sandri is located in the tiny town of Perno. 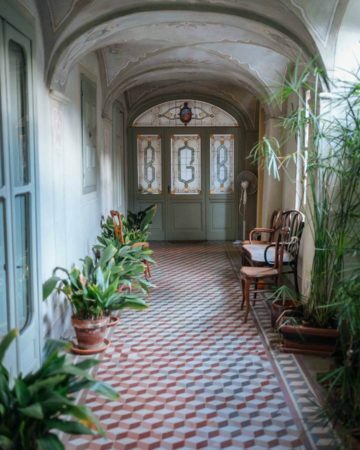 His estate offers stunning views of Serralunga d’Alba and the rolling Langhe hills. 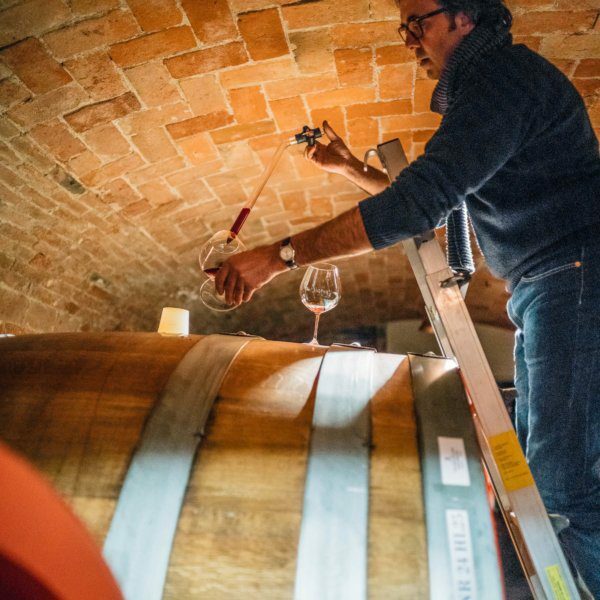 Elio is a natural winemaker in the truest sense of the word. He farms not only organically, but in an environmentally sustainable way. He explained that his minimal intervention approach extends to the vineyards, where he allows the vines to coexist with other vegetation, leaving natural herbs and plants that contribute to the vines’ health. As a result of his farming practices he uses much less fuel than other winemakers, and has more free time. As he explained, he’d rather go to a cafe and get a piece of cheese or salumi and a glass of wine than toil in the vineyard all day. Elio ferments his wine in concrete vats outside (at the base of his vineyard), which allows him to bring grapes down the hill, straight into the fermentation tanks. Downhill of the cellar, the hill forms an amphitheater shape, which Elio plants to Nebbiolo, Dolcetto, and Barbera, depending on the orientation. Elio’s wines are reflective of both the vineyard orientation and the cover crop. We tasted two wines from the same vineyard, one with more sun exposure and the other with more shade exposure and the difference is literally night and day. Similarly, one wine had more tobacco notes, while the other had more mint. By vinifying the wines separately and minimizing the use of oak, Elio respects the vine’s character. Our tasting of Elio’s wines was extensive, and included wines still in the botti, as well as reserve and library selections, which proved out how stunningly gracefully his wines age. One of the most magical wines we tasted was a Nebbiolo aged entirely in concrete. Elio’s nephew, who helps run the cellar, explained that as the wine has never been in oak, it can’t be labeled Barolo, so it would be declassified and bottled as Langhe Nebbiolo. We can’t wait to get our hands on these bottles.